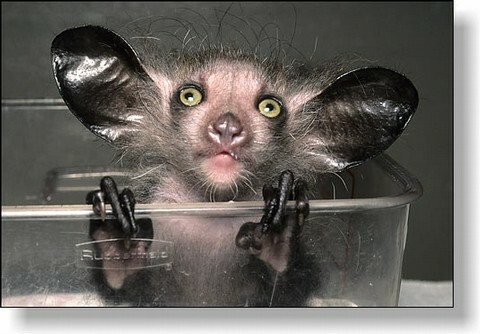 The Aye Aye is a mammal that can be found in the land of Madagascar. It is most closely related to apes, chimpanzes, and humans! They have an omnivore diet which consists of both plants and animals. Aye-Ayes are normally either dark brown or black, with a long and large bushy tail. They are also nocturnal creatures which means they spend most of thier time hunting at night. For years many people thought the animal was related to rodets because of its ever growing two front teeth. 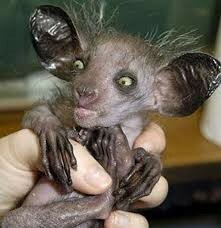 Also, the Aye-Aye is known for its oddly long middle finger that is used for feeding. They can use this finger for fishing out food in tree logs or eating different fruits that pertains to its diet. The finger even has sensory nuerons becuase they are precussive hunters. In the Madagascar area the people there have superstitions about the animal. They consider the animal an omen of bad luck. If the Aye-Aye points its middle finger at them they must kill it on the spot. 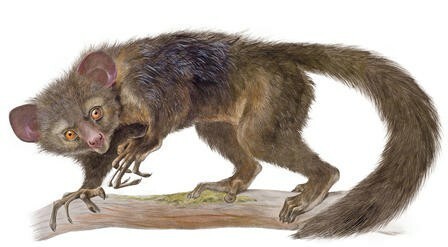 Because of this and the destruction of thier habitat, the Aye-Aye is know protected by law due to its endangered status. Did you know?Aye-ayes are the only primates thought to use echolocation to find prey.